The gaming experience has steadily improved since Pong. Each generation of console and processor brings more detailed graphics, faster framerates, improved sound, force feedback vibration, virtual reality, augmented reality and more. They're all designed to make games more immersive and realistic without actually injuring the player. 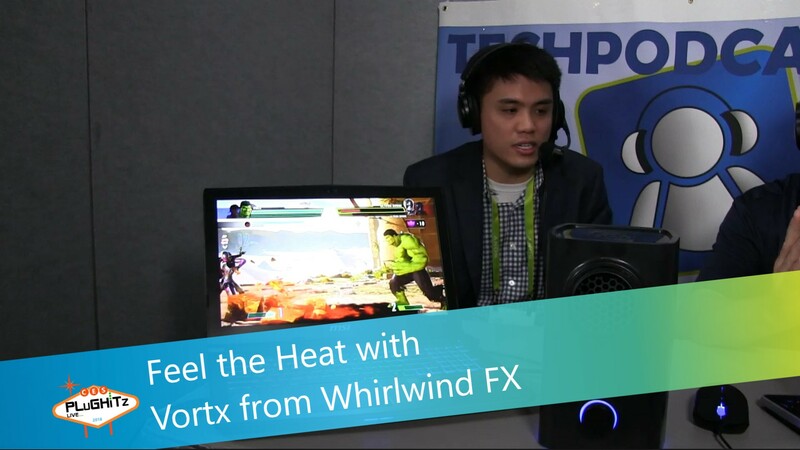 The latest addition to the gaming word is Vortx from Whirlwind FX: Todd takes the heat with Timothy, Founder and CEO. The Vortx brings greater realism to the player by blowing hot and cold air in response to on-screen action. Imagine a demon throwing fireballs: as the player dodges a fireball, the Vortx blasts hot breath at the player as the ball slips past. Or imagine an adventure game, climbing through frozen mountains: the Vortx chills the air as the player climbs higher. It's impressive. About the size of a desktop speaker (9" tall), the Vortx connects to a PC via USB and works with the Whirlwind FX engine. It uses object recognition and analysis to automatically trigger heat or cold, so Vortx can be used with any PC game without modification. The Vortx is available for pre-order now at $119, with shipping expected soon.